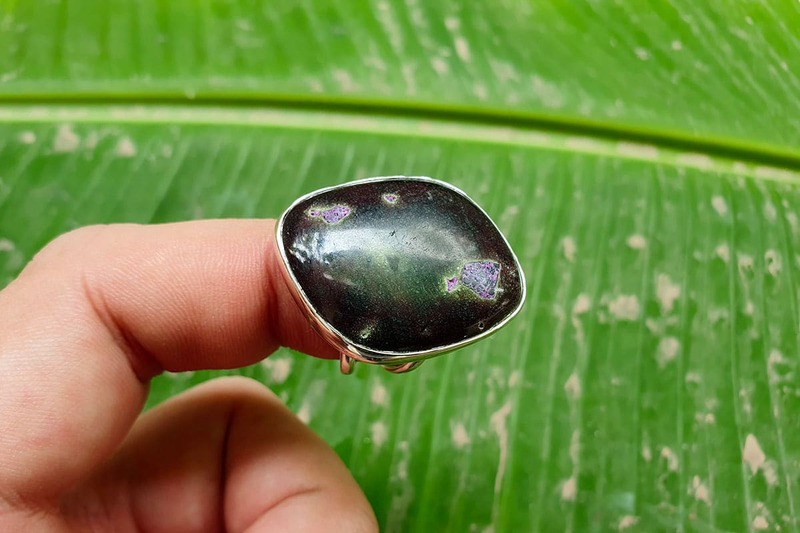 Serpentinite is a rock composed of one or more serpentine group minerals, the name originating from the similarity of the texture of the rock to that of the skin of a snake. Minerals in this group, which are rich in magnesium and water, light to dark green, greasy looking and slippery feeling, are formed by serpentinization, a hydration and metamorphic transformation of ultramafic rock from the Earth’s mantle. The mineral alteration is particularly important at the sea floor at tectonic plate boundaries. Serpentinization is a geological low-temperature metamorphic process involving heat and water in which low-silica mafic and ultramafic rocks are oxidized, anaerobic oxidation of Fe2+ by the protons of water leading to the formation of H2) and hydrolyzed with water into serpentinite. Peridotite, including dunite, at and near the seafloor and in mountain belts is converted to serpentine, brucite, magnetite, and other minerals — some rare, such as awaruite, and even native iron. In the process large amounts of water are absorbed into the rock increasing the volume, reducing the density and destroying the structure. The density changes from 3.3 to 2.7 g/cm3 with a concurrent volume increase on the order of 30-40%. The reaction is highly exothermic and rock temperatures can be raised by about 260 °C, providing an energy source for formation of non-volcanic hydrothermal vents. The magnetite-forming chemical reactions produce hydrogen gas under anaerobic conditions prevailing deep in the mantle, far from the Earth’s atmosphere. Carbonates and sulfates are subsequently reduced by hydrogen and form methane and hydrogen sulfide. The hydrogen, methane, and hydrogen sulfide provide energy sources for deep sea chemotroph microorganisms. Grades of serpentinite higher in calcite, along with the verd antique, breccia form of serpentinite, have historically been used as decorative stones for their marble-like qualities. College Hall at the University of Pennsylvania, USA for example, is constructed out of serpentine. Popular sources in Europe before contact with the Americas were the mountainous Piedmont region of Italy and Larissa, Greece.